Take advantage of the local and national partnerships with free clinics and community events! 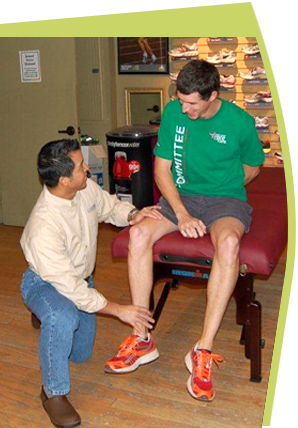 The third Saturday of every month, Ernest Ledesma offers a FREE running injury clinic at Fleet Feet Sports at 3405 Waters Avenue, Savannah, GA. Part of our committment to Living Well, the trained team will help you identify strenghts and weaknesses in gait and carraige and help you find footwear that supports and enhances your performance. CREW is group training for runners of all distances and levels, bootcamps, fitness assessments, VO2 testing, functional movement screenings, Alter-G Treadmills, resting metabolic rate testing, and more! In partnership with Ledesma Sports Medicine and Fleet Feet Sports! Ledesma Sports Medicine is proud to present the first Alter G Treadmills in the Savannah area. Don't shy away from fitness and health because of joint pain or injury. Alter G removes stress from your knees, ankles and feet by reducing gravity's pull in an airlocked chamber. Developed for NASA, Alter G can help an athlete train or an injured person to walk again! ONLY AT LEDESMA in Savannah, GA.
More about Alter G at Ledesma Sports! Quality Bike in Savannah, Georgia provides a huge selection of new and used bicycles. They also support charitable events such as the Wounded Warrior Savannah Unity Ride and others. Website. The Bicycle Link located in Downtown Savannah provides bikes, maintenence and accessories. Check their website here. Ledesma Sports Medicine is a sponsor of Savannah Save-a-Live. For more than 4 decades Save-A-Life has assumed a leadership role in advocating low-cost spaying and neutering in order to help prevent the wholesale slaughter of unwanted, homeless dogs and cats. Learn more about their mission here.